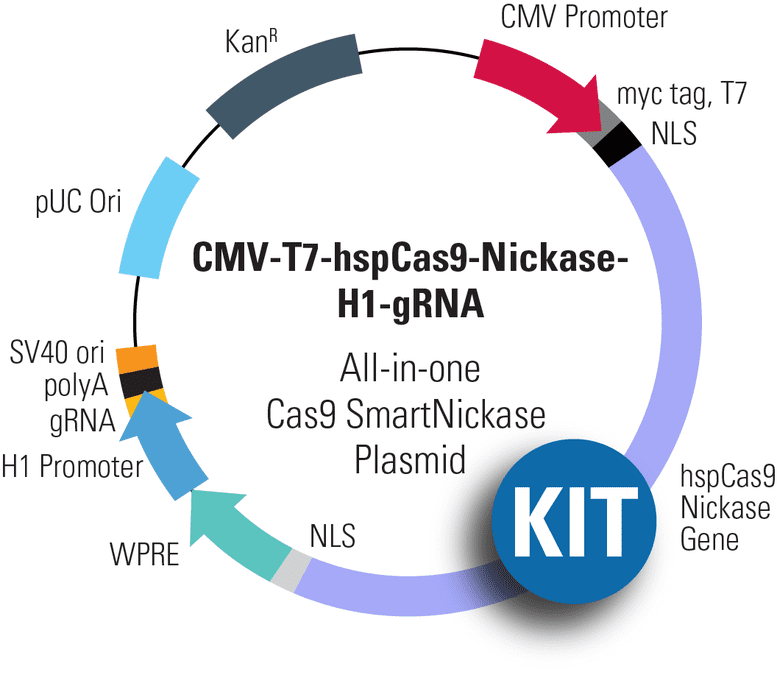 Easily enhance the power of the CMV-T7-hspCas9-Nickase-H1-gRNA All-in-one Cas9 SmartNickase™ Plasmid by combining it with the Multiplex gRNA Cloning Kit. Together, these two products can enable a wider range of genome editing projects that require multiple gRNAs. As with all of our Cas9 delivery options, the CMV-T7-hspCas9-Nickase-H1-gRNA Plasmid is functionally validated and comes backed by our expert technical support team—if you’ve got a genome engineering question just ask by emailing tech@systembio.com. Figure 1. The Multiplex gRNA Cloning Kit workflow. The PrecisionX Multiplex gRNA Cloning Kit provides H1 and U6 promoter blocks to easily build multiple gRNA cassettes (Figure 1). In Step 1, primers with overlapping ends containing the desired gRNA (designed by user) and the scaffold-promoter block (from the kit) are combined in a PCR reaction to generate a PCR amplicon containing both gRNAs. In Step 2, the PCR amplicon is combined with the fusion reaction mix along with the linearized expression vector for seamless construction.